Monday, August 19th, 2013 | Author: Bunco Betty! I was thinking about the (many) Bunco games I have played in the last eight years. One of my most favorite Bunco games that I planned was Dirty Dancing Bunco. It was the 25th anniversary of the beloved movie and I thought it would be fun to throw a Bunco party with a Dirty Dancing theme. Of course we had, you guessed it, the Dirty Dancing DVD on in the background. We had the sound turned down and the movie soundtrack CD playing. Everyone loved it and sang along! I also gave Dirty Dancing DVDs and CDs away as prizes for Snake Eyes as well as first and last Bunco. Our group gives the first person to get a Bunco her $5 back as well as a prize. They get to wear a fun themed necklace until we hand out prizes at the end. If you roll triple ones when you aren’t rolling for ones, it is called Snake Eyes. Whoever rolled it loses all of her points in that round and must yell Snake Eyes. Whoever rolled the last Snake Eyes throws the plush fuzzy die (like this awesome one from Bunco Game Shop) to her and the person who has the die at the end wins a prize. Spray 13×9-inch pan with cooking spray. Make and bake cake mix as directed on box for 13×9-inch pan, using water, oil and egg whites and adding pink paste food color. Line cookie sheet with waxed paper. I like to use two small cookie sheets from the dollar store. They fit nicely in my small freezer. Add frosting and mini chocolate chips; mix well. Shape into 32 oblong balls to look like watermelon; place on cookie sheets. Freeze until firm, at least an hour. When cake balls are firm, transfer to refrigerator. Remove several cake balls from refrigerator at a time. 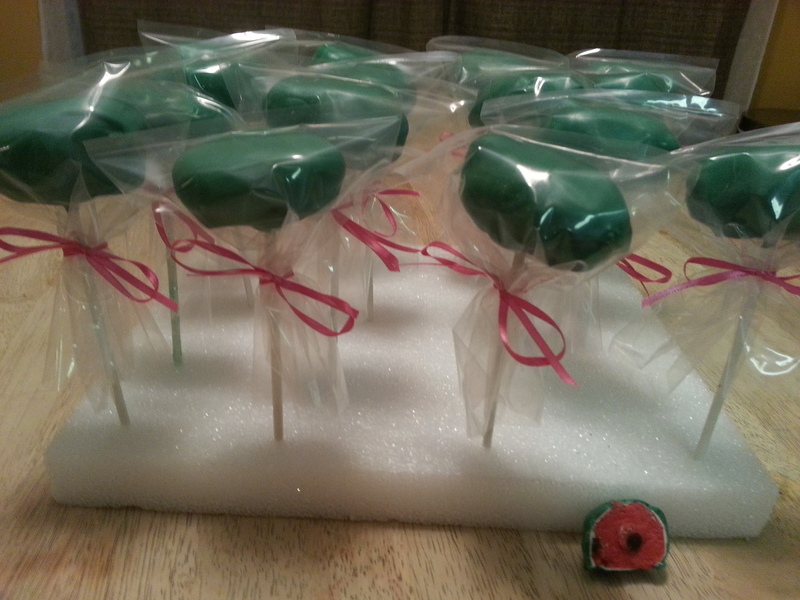 Dip tip of 1 lollipop stick 1/2 inch into melted white candy and insert stick into 1 cake ball no more than halfway. Dip each cake ball into melted candy to cover; tap off excess. Poke opposite end of stick into foam block. Dip each cake ball into melted green candy to cover; tap off excess. Return sticks to foam block. Let stand until set. What is your favorite Bunco theme? Do you use Snake Eyes in your Bunco game? What are some of your favorite Bunco rules? Let us know. We would love to hear from you.